Sometimes getting others to visualize your great idea is not so simple and takes some “selling” on your part. It may even take advance (or free) mock-up work to help some of the non-visual people in the room get on the same page with your idea. Here are a few things you can do to help you get your idea on the fast-track to approval and how to really sell your design concept. It is easy to talk about an idea, but design is a visual concept. It can also be tough to visualize someone else’s idea or concept. Do some work for the group before you present a new idea. Sketch out a rough layout or put together a mock site. Show the group what colors and fonts you are thinking of using. Make sure to really show the part of the design that is new and fresh. New concepts should be the most developed in your visual presentation. Don’t, though, spend too much time on your “dummy” project. Remember not all of your ideas will be adopted and you don’t want to lose too many work hours on a mock-up. Put together a clean, simple mock for the presentation; you don’t need a full-blown “finished” project to share. Know your audience. Is the group made of other visual people? 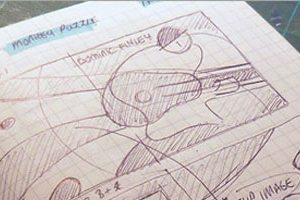 Understand whether a sketch is enough to explain a concept or whether you need to develop a more tangible concept. Make sure to bring plenty of copies (or show your design on a screen) so that everyone has access to the visual presentation. One of the best ways to gain credibility and push new ideas is to prove yourself as a designer every day. Doing quality work and having a proven track record at your company or among clients is one of the best sales tools you can have. There is no shame in showcasing some of your most successful projects when tackling a new task. As part of your pitch presentation, spend just a few minutes discussing other projects that you developed and why they were successful. Show off a design example or two and explain why it worked. Display confidence and loyalty. You must believe in your work for others to do the same. Develop positive relationships and create open lines of communication with everyone you associate with professionally. (It does not hurt to keep this in mind in your personal life as well; in the age of social media so many lines can cross unintentionally.) You are our own commodity in the design business and need to recruit other professionals who trust in your ability. Show your sketches to trusted peers in advance and take the suggestions into account. By working in advance and collecting other opinions, others will feel like they have had an impact on the design and are more likely to buy in to a concept. This network will help you sell your ideas as personal backers. They know you and your work. They understand your work ethic and can vouch for your creativity. A strong circle of “recruiters” can open the way for you to work with new people and land projects that you might not have had access to otherwise. Don’t wait to network. Start building relationships even when you are not in the middle of a project. Keep your portfolio up-to-date and always mention current projects when you meet with past clients. You never know when a passing meeting could send a new project your way. Design is a concept-based business. There are no definite answers when presenting visuals. Sometimes the best way to sell your idea is to present multiple variations of it. Show that your concept is flexible and that changes are easily adapted. Instead of bringing just a single sketch to a pitch meeting bring multiple options. There is no magic number, but three different design choices is a good starting point. Although the options do not have to be vastly different, make sure the changes are obvious. You want the options to look like options and not just slight tweaks to a single design. Discuss how other changes would work with your design and promote its flexibility. How would other colors or fonts work with the concept? How would you incorporate a much larger or smaller logo? For web design projects also explain how the design will work for other applications: Will it translate to mobile or tablet design? It can be hard to hear criticism about your design but understand that comes with the territory when you are working in a field without absolutes. Graciously accept constructive criticism and suggestions even if you don’t agree with what you are hearing. People generally want to work with other people who can collaborate. Combative words will not help you gain respect and trust when taking on a new project. Accept new ideas and discuss the pros and cons as they relate to the project. Understand that the client must be happy with the final result. If suggestions are not something you can work with and implement, you must decide if they project is something that you should take on. Finally, you might have to wait and revise and wait and revise. Very few final designs look like that first sketch. Understand that sometimes the process can take time. Be patient and work to make revisions or changes. Some projects require many layers of approval. Give the project time to get through the cycle before you give up. Make follow-up calls or send quick emails to track the project’s progress. Be patient with other projects. Don’t try to push the design envelope with every task you are assigned. Remember the boy who cried wolf? If you cry redesign on every project, you will not be taken as seriously when you have a concept that really works. Push for something new and unique when it is called for, but also know when to hold back. Having an idea for a great design is not enough. For that concept to see the light of day, you have to sell it. Be ready to show off your concept to potential internal or external clients, present design options for review and be patient on the way to success. Remember that not every project needs to be started from scratch and you have to show solid work before you get to tackle new things. Establish strong networks and a proven track record with your work so that your design projects will be accepted for publication. Image Sources: chris_blow, Andrew Kelsall, Phil Manker and karindalziel.